Peop­le who know how to save ener­gy or use it effi­ci­ent­ly and who pay atten­ti­on to the cli­ma­te as con­su­mers and with regard to food and mobi­li­ty can help to pro­tect the cli­ma­te. The ear­lier peop­le beco­me awa­re of this topic, the bet­ter. That is why Klasmann-Deilmann is again taking part in the cam­pai­gn to have trai­nees qua­li­fy as cli­ma­te pilots. This year’s trai­nees are Julia Roling and Nick Posch­mann and they will con­duct an in-house cli­ma­te check to spot­light the company’s per­for­mance. Armed with note­book and pen­cil, Julia Roling and Nick Posch­mann work their way through the com­pa­ny buil­ding in Gees­te, inspec­ting every nook and cran­ny. Chris­ti­an Nien­hus­mei­er, Pro­ject Mana­ger for Ener­gy Tech­no­lo­gy, helps them with their inves­ti­ga­ti­ons and pro­vi­des tips about what they should be loo­king for. They are now approa­ching our new buil­ding, the Inno­va­ti­on Cen­ter. “The wall clad­ding is made of recy­cled mate­ri­al. Do you see?” Chris­ti­an Nien­hus­mei­er points to the panel­ling on the faça­de. “You can’t tell from a distan­ce, but it is made of wood,” he says, tap­ping on the mate­ri­al. Click here to read our arti­cle about pho­to­vol­taics as an ele­ment of sustai­na­bi­li­ty. The three then move on to the new rese­arch green­house. The walls of the green­house have dou­ble gla­zing. “Again, we gave high prio­ri­ty to ener­gy effi­ci­en­cy. That is why many things are done auto­ma­ti­cal­ly, such as con­trol­ling the tem­pe­ra­tu­re, ope­ning and clo­sing the win­dows and posi­tio­ning the ener­gy screens,” exp­lains Chris­ti­an Nien­hus­mei­er. “The­se screens make sure that the heat stays insi­de the green­house and simul­ta­ne­ous­ly pro­tect the plants from too strong sun­light and over­hea­ting.” Despi­te the­se effec­ts, the expe­ri­men­tal green­house has far hig­her ener­gy con­sump­ti­on than the new head office buil­ding. “One of the rea­sons for this is that we have to main­tain a cer­tain tem­pe­ra­tu­re at all times, i.e. in both sum­mer and win­ter, and not just during the day­ti­me but also at night.” Ano­t­her rea­son is that it has to be ven­ti­la­ted fre­quent­ly to keep the rela­ti­ve humi­di­ty low. The next stop is the work­shop, which was built in the 1920s. At that time, buil­dings were desi­gned com­ple­te­ly dif­fer­ent­ly and insu­la­ti­on was by no means stan­dard. “This means we have to take a dif­fe­rent approach to get the buil­ding warm. That is why we work with infra­red radi­ant hea­ters,” says Chris­ti­an Nien­hus­mei­er, and exp­lains how the­se devices work. Unli­ke other hea­ting sys­tems, they heat solid bodies ins­tead of the ambi­ent air. Tog­e­ther the three inves­ti­ga­tors take a look at the hea­ting plant and exami­ne the light sources, almost all of which are mean­while based on LED. It is abso­lute­ly clear: the­re is no shor­ta­ge of mate­ri­al for the cli­ma­te check and many aspec­ts to con­si­der. Both trai­nees have accu­mu­la­ted a gre­at deal of input during the first block of cli­ma­te pilot trai­ning and – in addi­ti­on to hand­ling the cli­ma­te check at the com­pa­ny – have also deci­ded to con­duct a sur­vey to find out how many employees cycle to work. “The per­cen­ta­ge will pro­bab­ly not be very high,” pre­dic­ts Nick Posch­mann (trai­nee indus­tri­al main­ten­an­ce mecha­nic). “Here in the coun­try, many employees have to tra­vel qui­te a long distan­ce to work. That has to be taken into account when eva­lua­ting the figu­res,” says the pro­s­pec­tive cli­ma­te pilot. Here you can read ano­t­her arti­cle about cli­ma­te pilots in our com­pa­ny. The second block of les­sons will begin in June and will eva­lua­te the fin­dings. We are eager­ly awai­ting the out­co­me, as this is the third time we have sent trai­nees to qua­li­fy as cli­ma­te pilots. As a result, the trai­nees could split up the cli­ma­te check into the dif­fe­rent buil­dings. 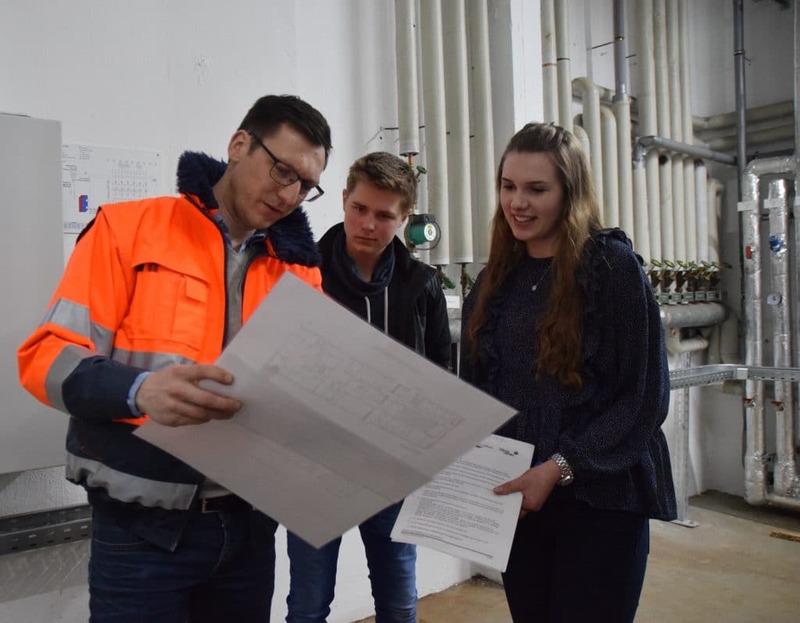 The first two can­di­da­tes asses­sed our for­mer admi­nis­tra­ti­on buil­ding, the next group ana­ly­sed the ener­gy figu­res for the work­shop and Julia and Nick are con­duc­ting the cli­ma­te check for the new head office buil­ding. Cli­ma­te pilot trai­ning is a joint pro­ject run by the Ener­gy Effi­ci­en­cy Agen­cy of the Ems­land district, Werl­te Cli­ma­te Cent­re and Mar­stall Cle­mens­werth Youth Edu­ca­ti­on Cent­re.